The 8th Annual Boca Burger Battle takes place inside beautiful Sanborn Square Park in downtown Boca Raton, Florida. 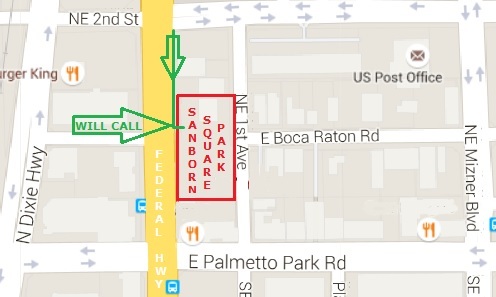 The Will Call Entrance is located on the west side of the park along Federal Highway. It's in between Palmetto Park Road and NE 2nd Street. There is ONLY ONE ENTRANCE IN and OUT of the event. Please see MAP BELOW...GREEN AREA THAT READS "Will Call Entrance". Please utilize all FREE and PAID parking areas throughout the downtown area. Be sure to avoid Tow Away signs! Questions regarding the event location, parking, or traffic inquires please call 561.338.7594.